When heavy rain falls in the city, roads and footpaths become runways for toxic chemicals that flush into stormwater, polluting rivers and streams. Alexandra de Blas looks at an innovative new solution to the problem. In the chaos and suffering caused by natural disasters, the environmental impacts of relief and reconstruction efforts may not seem a priority. But in recent years, there has been a significant push to ‘Build it Back Green'. 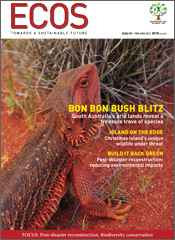 A biodiversity audit on Bon Bon Station Reserve in the arid north of South Australia has revealed a treasure trove of native plant and animal species. Periodic short-term cooling in global temperatures should not be misinterpreted as signalling an end to global warming, according to CSIRO Marine and Atmospheric Research Honorary Research Fellow, Barrie Hunt. The Bureau of Meteorology's annual Australian Climate Statement for 2010 concluded that the 2010 La Niña event brought Australia's third-wettest year on record and the country's coolest year since 2001; however, the decade 2001–2010 was Australia's warmest. Australian and Swiss researchers have been working together and with agricultural enterprises and major food companies to develop a standardised approach to measuring ‘water footprints' – the amount of water embodied in food and other consumer products. An environmental catastrophe is unfolding on Christmas Island, the site of Australia's latest suspected mammal extinction. The unique wildlife of the island is struggling to cope with the impact of humans and introduced pests. The information technology (IT) sector's phenomenal growth and appetite for energy have produced a bulge in its carbon waistline. It's not a good look when the world is warming at a rate unprecedented in recorded history. Just how big is the IT sector's footprint in Australia? Tropical Cyclone Yasi and the devastating floods in south-east Queensland came as a double blow to the state's tourism industry this summer. But some tourist operators were better prepared than others, thanks to the foresight of Tourism Queensland – and a CSIRO information tool that enables operators to better manage business risks in the face of extreme climate events. The success of a company and the well-being of the communities it serves are connected. A business needs stable and viable communities to be successful, and communities depend on successful businesses to provide products, services, jobs and infrastructure. In 2010 the Beyond Zero Emissions group released a report with the University of Melbourne's Energy Research Institute claiming that Australia could be powered by renewable energy sources by 2020. Here its lead authors reply to some of the points raised by Dr Mark Diesendorf's review of the report in ECOS 157. Given the need for both short and long-term training for sustainability discussed in the first of this three-part series (ECOS 158, pp 22–24), it is clear that the vocational education and training sector will play a major role in building capacity for our nation over the next five years. How does today's climate change differ from similar events in the past? What does the best science tell us about where we are heading? And how does research suggest we should respond to the challenges? CSIRO summarises the key peer-reviewed research in an easy-to-read, free-access, online book – Climate Change: Science and Solutions for Australia.